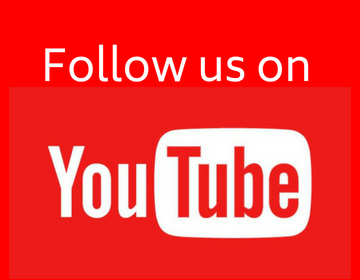 Q.1 Which one of the following materials cannot be used to make a lens? Q.2 The image formed by a concave mirror is observed to be virtual, erect and larger than the object. Where should be the position of the object ? Q.3 Where should an object be placed in front of a convex lens to get a real image of the size of the object ? (c) the mirror is concave and the lens is convex. 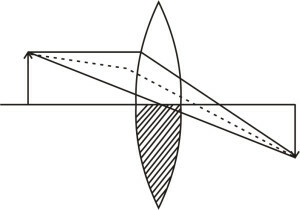 (d) the mirror is convex, but the lens is concave. Q.6 Which of the following lenses would you prefer to use while reading small letters found in a dictionary ? 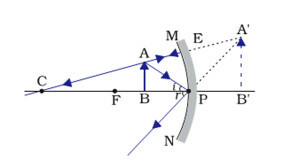 (a) A convex lens of focal length 50 cm. (b) A concave lens of focal length 50 cm. Q.7 We wish to obtain an erect image of an object, using a concave mirror of focal length 15 cm. What should be the range of distance of the object from the mirror ? What is the nature of the image ? Is the image larger or smaller than the object ? Draw a ray diagram to show the image formation in this case. Sol. 15 cm - range. Q.8 Name the type of mirror used in the following situations. Sol. 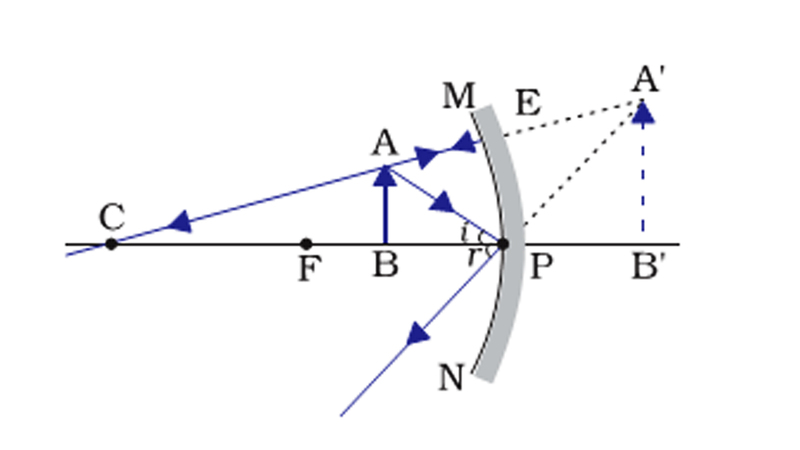 (a) Concave mirror - The bulb placed at focus throws parallel beam of light after reflection. (b) Convex mirror - To get wider field of view and erect images. (c) Concave mirror - To converge the rays of sun at its focus. Q.9 One-half of a convex lens is covered with a black paper. Will this lens produce a complete image of the object ? Verify your answer experimentally. Explain your observations. Sol. Complete image of the object will be formed. The intensity of light will be reduced. Q.10 An object 5 cm in length is held 25 cm away from a converging lens of focal length 10 cm. Draw the ray diagram and find the position, size and the nature of the image formed. Image Position = 16.7 cm. Image Size = 3.3 cm. Q.11 A concave lens of focal length 15 cm forms an image 10 cm from the lens. How far is the object placed from the lens ? Draw the ray diagram. Q.12 An object is placed at a distance of 10 cm from a convex mirror of focal length 15 cm. Find the position and nature of the image. u = – 10 cm ; f = 15 cm. Therefore v = 6 cm. Image is behind the mirror, virtual, erect and diminished. Q.13 The magnification produced by a plane mirror is +1. What does this mean ? Sol. Magnification +1 means that an erect image is formed, having same size as object. Q.14 An object 5.0 cm in length is placed at a distance of 20 cm in front of a convex mirror of radius of curvature 30 cm. Find the position of the image, its nature and size. h = 5 cm ; u = – 20 cm. Therefore, v = 8.6 cm. Therefore, v = – 54 cm. Screen distance 54 cm, real, inverted image of size 14 cm. Q.16 Find the focal length of a lens of power - 2.0 D. What type of lens is this ? Q.17 A doctor has prescribed a corrective lens of power +1.5D. Find the focal length of the lens. 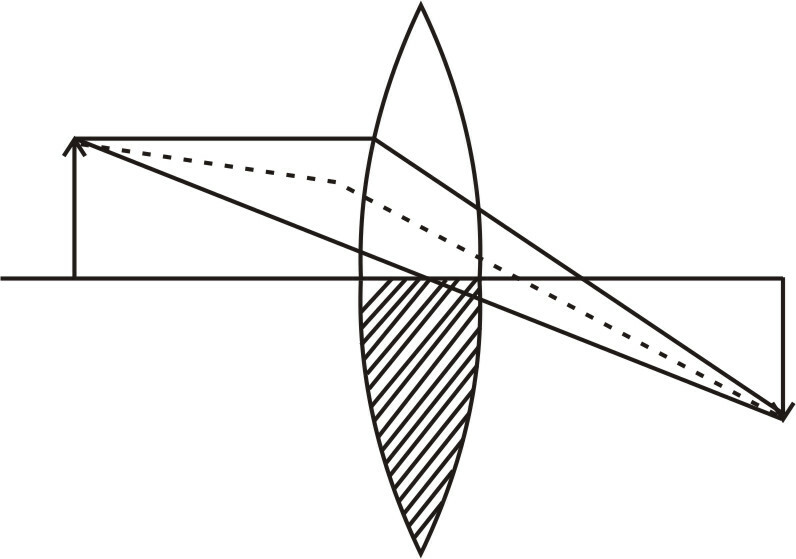 Is the prescribed lens diverging or converging ?